When the PGEC group met at UCLA in January of 1951 and fourteen California groups reported on their current computer development projects, the Electro – Circuits group was destined to be the least remembered as a computer pioneer. Electro – Circuits was a Pasadena company located at 401 E. Green St. and was incorporated in 1951 by its president, Donald Calvin Erdman, to develop and market ultrasonic testing equipment. The company went on to have considerable success in the development of equipment and procedures for non-destructive testing of piping and other materials. Erdman had connected with George B. Greene of Pasadena and the two of them filed jointly for patent 2,743,429 on October 14, 1950 with the assistance of Pasadena patent attorney James Christie. 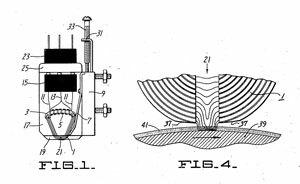 The patent was for a device that would maintain a transducer at a constant distance and angle from a surface. For Greene the device was an extension of technology that he had been involved with during World War II, but Greene’s real passion in 1950 was to build a commercially viable computer. George Boyd Greene was another of the southern California computer visionaries. Born in 1912 in Arkansas and raised in Lincoln, Nebraska, Greene and his wife, Mary (Finigan), moved to California in the late 1930s where George worked during World War II as a mechanical/aeronautical engineer for the Leo Harvey Company developing radio direction finding equipment. It’s not clear what path he followed from Leo Harvey to joining forces with Erdman and Electro Circuits in 1950-51, but by late 1951 he had formed his own company, Physical Research Laboratories, with Donald White and set up shop at 542 North Fair Oaks in Pasadena. Importantly, he had also gained a financial partner for his computer project. Atlantic Refining Company of Philadelphia had agreed to purchase the prototype machine, dubbed the MINIAC, for some $50,000 to analyze data from their CEC mass spectrometer. Nine years earlier, it was Atlantic that had made a similar commitment to purchase the first mass spectrometer produced by Consolidated Engineering. The memory drum, which is 6-1/2 inches in diameter and 10 inches long, is driven at 6000 rpm. The memory head, a development of the laboratories, is based on a torroidally wound mu-metal ribbon core. Greene applied for and was awarded a patent on the head design so we are fortunate to have detailed diagrams and specifications available as well as a picture from the later MINIAC marketing brochure. Greene’s MINIAC wouldn’t be delivered to Atlantic Refining in Philadelphia until late in 1953. But the announcement in late 1951 got a lot attention. The key to this was the MINIAC’s reported price of $50,000. Cuthbert Hurd’s scientific computing group at IBM could offer their CPC equipment for the same application but it was both slow and difficult to program for the desired results. In February of 1952, Hurd noted that Standard Oil was delaying their CPC order until they could investigate Greene’s machine. At about the same time, in Philadelphia, Burroughs Research staff had heard the same report of the Atlantic purchase although they believed that the machine was coming from CEC. They were in the process of making initial contacts with Atlantic to set up the solution to spectrometer problems on their new Burroughs Lab Computer. There is not much doubt that the successful sale of Greene’s computer to Atlantic Refining helped influence CEC to enter the marketplace with their own system. CEC maintained a close relationship with Atlantic Refining and the other users of their spectroscopes via their training programs and an annual user conference that they sponsored from 1945 through 1952. These conferences evolved into the industry-wide ASTM conference on spectroscopy beginning in 1953. When CEC began their Datatron computer project, the team had to make a buy versus build decision on a memory drum. They began by acquiring one of the Greene Drums to evaluate alongside their own design. Another person who noticed Greene’s computer project was Edgar B. Jessup. Well known in the Bay area and almost always photographed with a bowtie, Jessup had been president of Marchant Calculator Corporation in Oakland since 1933. He had the foresight to realize that the days of the mechanical calculator for science and engineering projects were rapidly coming to a close. Jessup was a marketing man. A native Californian, he grew up on a farm in the southern part of Monterey County. After finishing high school, he had gone into sales and found great success selling office equipment, including calculators, in San Francisco. When Marchant ran into financial trouble during the depression, Jessup was brought in as president and saved the company. He had two long-time associates who ran the operations side of the business: Harold T. Avery served as Chief Engineer and Walter Kassebohm who also had an engineering background, handled manufacturing. Avery had attended the 1948 UCLA Computing Conference and by 1950 Marchant had joined forces with Raytheon to produce a mechanical calculator that handled binary and octal numbers. Jessup wanted an entry into the emerging electronic computer market. On August 7, 1952 most major newspapers carried some form of Marchant’s press release of the previous day announcing that Marchant had entered the electronics field through the acquisition of a controlling interest (70%) in Physical Research Laboratories, Inc., of Pasadena. The release also noted that Physical Research had been renamed as Marchant Research, Inc., and that all activities had been moved to Oakland. Greene was now president of Marchant Research, Inc. The first Greene MINIAC was delivered to Atlantic Refining in Philadelphia in September of 1953 and reportedly performed well. Atlantic then purchased a second system for delivery to their Dallas refinery but significant modifications occurred. To squeeze more accuracy out of the machine, the second one could operate as a hexadecimal machine in addition to its original configuration as a decimal machine. The second MINIAC was delivered in February of 1955 and billed as the largest and fastest computer in the Southwest by Texas newspapers. Another part of the Q&A session suggests that Greene had a very early interest in office productivity applications. Those magnetic stripe card readers, magnetic tape cassettes and an adapter to operate any make of electric typewriter presaged the word processor and any number of office productivity applications that were years in the future. Greene’s research staff at Marchant had grown to the same size as Avery’s, with about 50 people employed in each. A look at the 1954 financial results revealed serious trouble brewing. Greene’s division had contributed to record research and development expense which in turn had a significant negative impact on Marchant’s profits. With little revenue expected from the new computers for two years, there could be problems ahead. Jessup: Edgar Jessup retired from Marchant at the end of 1957. He continued to live in Oakland and passed away in May of 1961. Marchant: In April of 1958, Smith Corona, Inc., of Syracuse, New York, began merger discussions with Marchant. The merger was completed in June and Marchant became the “M” in the resulting SCM Corporation. Marchant operations had just moved into a new plant and headquarters building on San Pablo Avenue in Oakland. In 1962, SCM announced the removal of manufacturing operations to a smaller plant in Orangeburg South Carolina gaining a 60% decrease in taxes and 40% decrease in the cost of semi-skilled labor. The four year-old plant would be sold. George Greene: When George Greene presented the MINIAC at the 1954 Joint Computer Conference, he emphasized the magnetic card and typewriter input-output interface. Key to this interface was a servo unit which occupied the space below a standard typewriter and “which converts the typewriter into a magnetic-tape-reading-magnetic-tape-writing typewriter.” About a year after the IBM Selectric typewriter appeared on the market in 1961, Greene applied for and received U.S. Patent 3,219,165 which converts a Selectric into the “Letteriter,” a tape controlled typewriter. In 1968, this ad for a used Letteriter appeared in the MIT Tech. Other references are scarce. 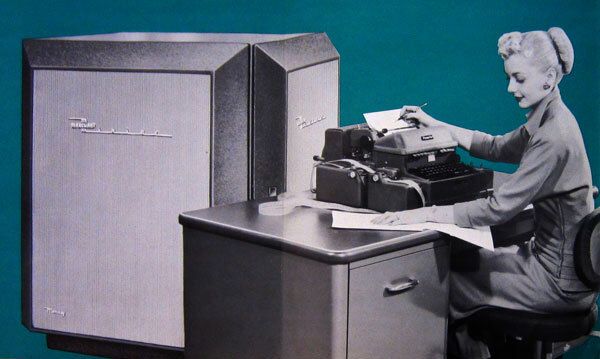 Note that a new IBM Selectric could be purchased for under $500. In all, he received a dozen patents between 1961 and 1968 including one for a pulsejet engine. After a few additional years in the Oakland area following his surrender of the Marchant Research presidency, he returned to southern California, living for a time in Newport Beach. He later retired to southern Maine in the town of Eliot where he passed away in 1989. He is buried in Lincoln Nebraska alongside his father.